Note: These plans consist of a booklet of 18 pages of text, drawings and photos on 8.5" x 11" pages plus an 18" x 24" drawing. The printed version is black and white. The PDF file for instant download has color photographs. To save $10 and postage costs choose the download option below. 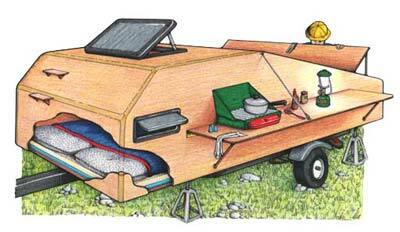 Need a custom camp trailer? Build this lightweight rig all modified to suit your own needs and sleep in relative comfort regardless of the weather. The camp pod is more watertight than a tent, the ply-sides are pest proof, and it sits off the ground to keep it dry. 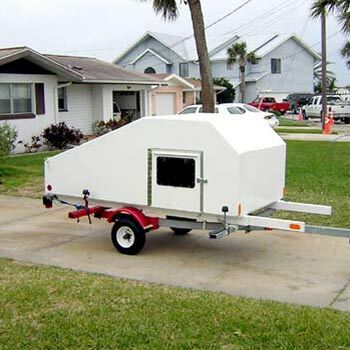 Inspired by teardrop style trailers popular in the 1940's, this simplified version is built of plywood, with optional epoxy and fiberglass enhancements. The completed module is designed to fit onto a small utility trailer or boat trailer, secured by bolts and straps, and can be removed in minutes for storage. The interior can be insulated with sheet foam and carpeting to keep it cozy, side or top mounted access doors, drop-leaf tables and dedicated storage spaces can be fitted as required, along with ventilation and light hatches and ports. A 4 x 8 version will sleep one in luxury, two in comfort, or three real good friends. Enroute to the campsite the pod provides enclosed storage space and can also be equipped to haul boats and bikes. Construction techniques allow easy modification and the pod can be built and finished basic and utilitarian, or ultra-lightweight with rounded glass-taped corners, side doors and hardwood trim. The basic shape and size can be modified to suit. 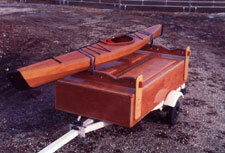 Small aerodynamic shaped solo versions have been built to tow behind motorcycles and small cars, and simple rectangular versions have been built as storage trailers to transport camp gear, bikes and boats. Other builders have maintained a more traditional tear-drop shape to the pod, bending a sheet of 4 mil hardwood ply over the teardrop shaped sides, rounding and reinforcing the corners with fiberglass tape as with wood boat construction. Equipped with locking compartments the pod also provides secure waterproof storage space back at home. Using boat-building technology and quality materials the module is designed to last for years with minimal maintenance. The building plans lead you through the process step-by-step and include a blueprint and a spiral-bound booklet with discussion of options, materials sources and building tips. The building plans also encourage modification to suit.